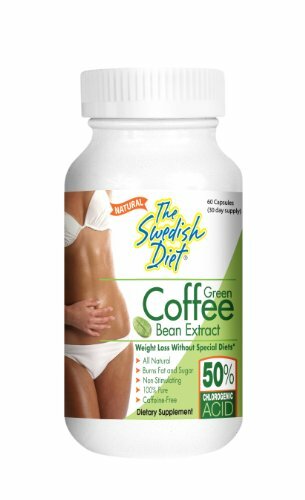 The Swedish diet green coffee bean extract capsules. Weight loss without special diets all natural weight loss supplement burns fat and sugar non stimulating 100% pure caffeine free. Serving size: 2 capsules. Servings per container: 30. Chlorogenic acid works by inhibiting the release of glucose in the body while at the same time boosting the metabolism or the "burning" of fat in the liver. HIGH QUALITY Natural Product Made In The USA in an FDA Approved Facility. If you have any questions about this product by The Swedish Diet, contact us by completing and submitting the form below. If you are looking for a specif part number, please include it with your message.